"Paper can cover the rock but scissors can cut paper." 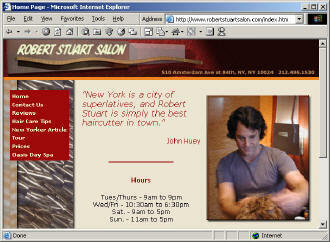 The Robert Stuart Salon website was designed to reflect the structures, textures, and colors found in the actual salon on Amsterdam Ave. in New York City. This site features a 3D logo, seamless textures created from photos of salon decor, and a QuickTime VR tour of the salon courtesy of Eclectrix, Inc. I also did photography for the interiors, Robert, and the fashion models shown on the site. This Roher/Sprague Partners website was designed for simple maintenance as well. In addition to a normal site design, I also created a cascading style sheet based theme for use in FrontPage 2002 in order to apply a branded look to the automated SharePoint Team Services subwebs used on the extranet collaboration sites. The collaboration extranet sites offer multi-user discussion forums, file sharing, and contact management using a SQL Server back end. This site uses my single file independent user interface technique. 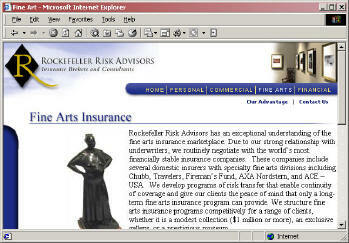 ASP programming was used to control the links in the user interface and also change the imagery in the upper right corner on each section. Circa 2001. 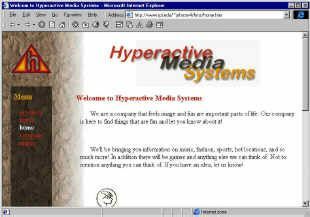 This is a web site design created in the early spring of 1997 for Hyperactive Media Systems. It's design was such that it could be easily changed to support future HTML conventions such as DHTML and CSS1 when those features did become available. It uses a site wide linked cascading style sheet to define the styles used in the site's construction. The semi-transparent effect done with table background image attributes is also seen here. An impressive feature to this site was it's animated spinning rap-logo which was origionally illustrated by Stephen Howard, 3 dimensionally modeled by Adam Lein, then animated by Matthew Johnston in 3DS MAX. © Adam Z Lein, 2002 All artwork property of Adam Lein, unless otherwise noted.